Hidden within some of our collections you can find content which you might not expect to see! A great example of this can be found in our collection of Japanese Maps of the Tokugawa Era which features a sub-collection of disaster prints, made up of several dozen prints which describe disasters that occurred in Japan. While some of these prints, such as the ones showing fires and tsunamis, are fairly self-explanatory it was only when one of our digitizers translated some of the text on others that we understood how they were related to disasters. 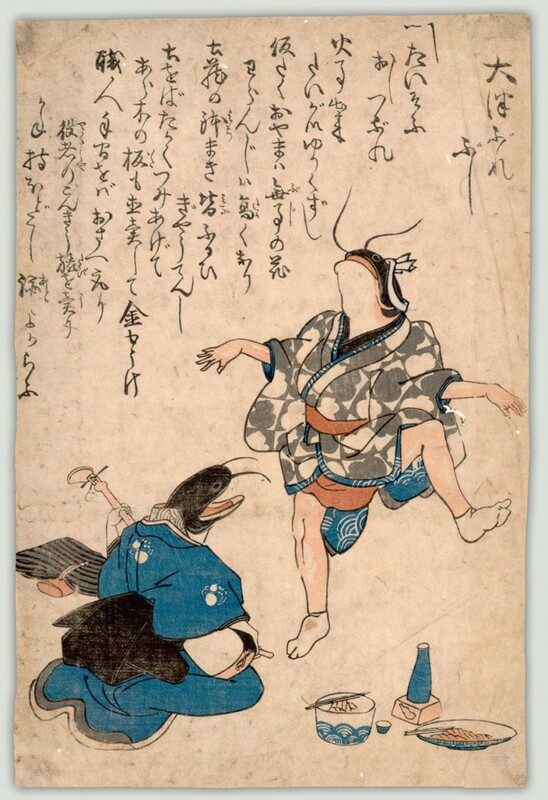 A number of the prints in this collection feature catfish, known as namazu in Japanese. These can be incredibly confusing when first encountered, both in the “What is that thing?” way (as they frequently have both arms and legs) and the “How is this related to disasters?” way. Things become clearer upon discovering that a giant namazu was blamed for the 7.0 earthquake that happened below Edo (now known as Tokyo) in November, 1855. 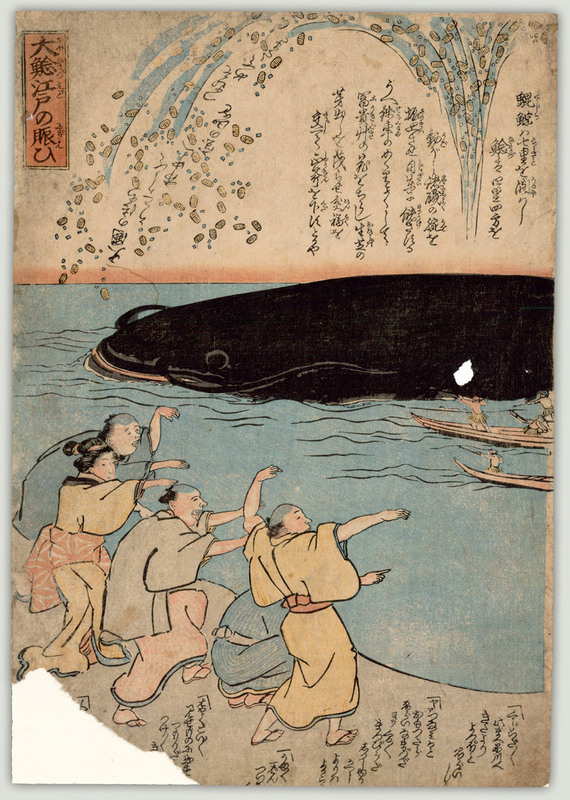 Just days after this event ukiyo-e woodblock prints depicting giant catfish began to be produced and sold. The Namazu was supposed to be a giant catfish who lived underground, pinned beneath the foundation stone of a local shrine by the god Kashima. However, when Kashima failed at his task (due to being at a gathering for various gods) the Namazu was able to thrash around and cause much destruction in the form of earthquakes. 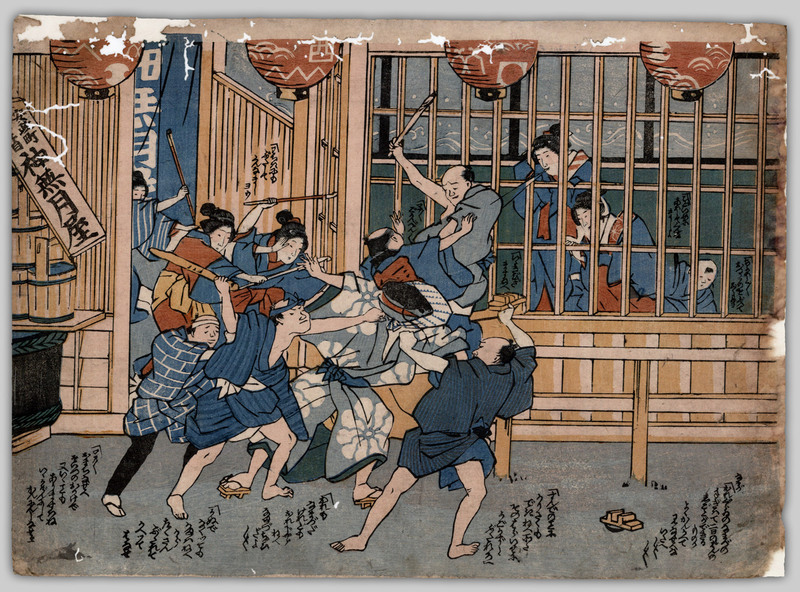 While many of the prints promised to protect people from future earthquakes, others were more aggressive featuring humans subduing or otherwise taking revenge on various Namazu. 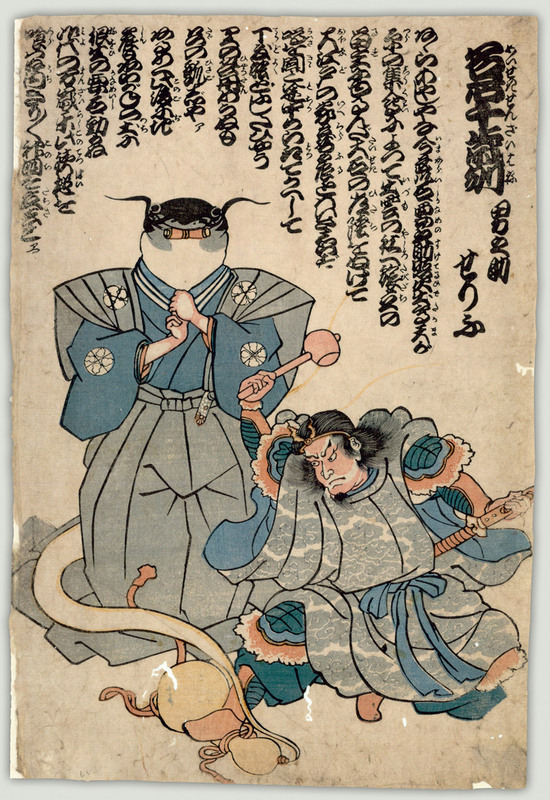 However, not all of the prints portrayed the Namazu negatively, as some featured them helping to rescue people from the diaster or showering coins onto people appearing in the image. This second theme was based on the idea that disasters were the result of various deities punishing humans for greed or other failings, but were also an opportunity to redistribute wealth as there were many people, such as builders and carpenters, who had much to gain after disasters. The Namazu-e prints proved quite popular, with somewhere between three and four hundred different designs printed in the two months following the earthquake. However, due to satirical political statements that could be found in some of them the government banned their creation and the printing blocks were destroyed. To see our complete collection of Namazu-e prints (plust prints showing other disasters), you can go to our website or check out our Flickr page.